Corsica is a French island in the Mediterranean Sea. It is located west of Italy, southeast of the French mainland, and north of the Italian island of Sardinia. 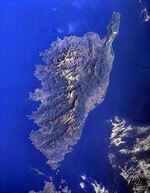 Mountains comprise two-thirds of the island, forming a single chain. Corsica is one of the 27 régions of France, although strictly speaking Corsica is designated as a territorial collectivity (collectivité territoriale) by law. As a territorial collectivity, it enjoys greater powers than other French régions, but for the most part its status is quite similar. Corsica is referred to as a "région" in common speech, and is almost always listed among the other régions of France. Although the island is separated from the continental mainland by the Ligurian Sea and is closer to Italy than to the French mainland, politically Corsica is part of Metropolitan France. It was once briefly an independent Corsican Republic, until being incorporated into France in 1769. Its culture has French and Italian elements blended into it.